There are videos on those pages too. 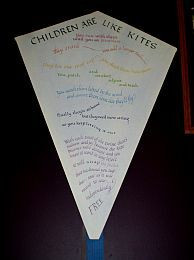 The kite was part of a foyer display at the Tea-Tree Gully library, in Adelaide, South Australia. The Calligraphy Society of South Australia was behind the display. The calligrapher in this case was Beverley Carter, who gave me a little background info. The photos are displayed with Beverley's permission. See all the fancy writing on there? It's a poem! The first 2 attempts at the calligraphy were rejected, but the 3rd seemed to work nicely when done directly onto the sail of a simple kite. The work actually dates back to 1998, when it was entered in the Royal Adelaide Show. The judges of the Calligraphy section thought the concept worked pretty well too, and awarded it the prize! With a whole section of this website devoted to Kid's Kites, we just had to do a page on this delightful piece of kite art. 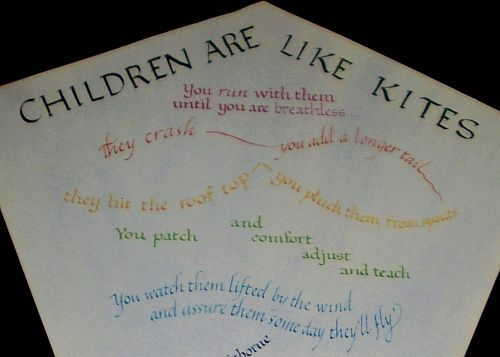 Particularly when the poem is titled CHILDREN ARE LIKE KITES! Something different isn't it. Making Skewer Kites is a handy download of printable step-by-step instructions. You run with them until you are breathless. they hit the roof-top – you pluck them from spouts. and assure them some day they’ll fly. so you keep letting it out. soar as it was meant to soar… independently free. Every parent would relate to most of that, wouldn't they? Also, just about everyone on the planet has seen or actually flown a simple kite at some stage in their lives. Patricia Lovett's page featuring a simple kite image overlaid with calligraphy describes the process and techniques involved. There's some fine art in there! A good kite not only becomes more distant, it also climbs higher as line is let out. Eventually it will stop climbing, but let's not get too technical about it! The point is, the climbing kite could represent a kid enjoying the fruits of a good upbringing. That is, reaching ever higher points in various spheres as life goes on. Shifting to near the end of the poem... I don't know about the won't be long until it snaps the line bit! I guess it's just poetic license, but I certainly hope no kite of mine gets free any time soon. Mind you, my little Aren is liable to toss the winder onto the grass at any time, if you let him have it for a while! That brings me to one more philosophical point. A simple kite can only perform as designed when operating within the boundary set for it - the constraint of the flying line! Cut the line, and the kite will soon end up on the ground, totally unable to fly on its own. Kids need boundaries too, according to people who know far more about the topic than I do. Now, that last point seems to contradict the poem! However, the poem is just being creative with regard to the child 'cutting the string' that holds them to their parents. Not being a textbook on kite flying, there's really nothing wrong with how the poem ends at all. There's more to it than just the formation of those attractive flowing characters. The sentences themselves can move around and change shape to support the concepts they are expressing. For example, see the 3 lines in the close-up photo! Also, did you notice that the words of the entire poem form a rough outline of the kite itself? Just look at that photo near the top of this page again, and imagine that the kite is removed, leaving just the words. 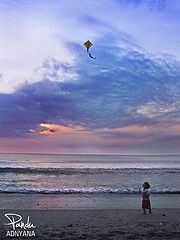 This provides a concrete connection between the written words and the subject matter of kites. With a few bamboo BBQ skewers - thin ones - it's not hard to put together a simple kite or even something more ambitious than a diamond. Paper or thin bag plastic are good for sails, although the plastic will last longer. Making Skewer Kites is a printable PDF file download containing many tested designs. Finally, the variety in colors is attractive, just as a typical kid's plaything is colorful. Just one ink color would have been a bit boring here, don't you think? Having a 2 1/2 year old boy myself, some parts of the poem certainly resonate with me! By the time Aren leaves home, I might be relating even more to this poem.